All you need to do is contact us, tell us what your arrangements are and we will get something booked in for you. Move over limousines, and say hello to a Kombi. 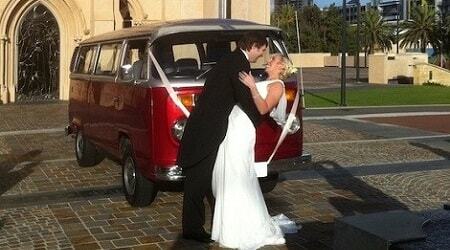 Kombi Hire Perth provides you with the best Limo alternative in Perth for every occasion. Be it a school ball, a birthday party, a wedding or a corporate event, we would love to provide you with our services. Our professional promise is to give you the most impeccable travel experience in town. Our Kombi style Limos are extravagant and certain to get attention. It is our wish for you to feel like a star and ride around with a smooth and royal style. Professional drivers and value for money. Our professional drivers have expertise that insures that you reach your destination sound and happy. We would hate for you to pass up the great opportunity of making your event just perfect with our extravagant Kombi all in view of an affordable rental cost. It is necessary that we provide the best services at the best cost. We have tremendously impressed many clients with our awesome top end quality Kombi style limo service throughout the years of our business operation in Perth! There are numerous car hire services out there but there is only one Kombi Hire Perth; The Kings of Cruising! Let us whisk you off your feet and have you to your next destination, wherever that may be. Limousines are overrated, try something more extravagant like a Kombi. Everyone wants service from the best in the industry. Well here is a chance to do just that and have the Kombi Experience of your life. We here at Kombi Hire Perth have the best Kombis in Perth which will bring the best out of your travels with us.